Born in New York City, NY, he moved to Winnipeg as a young boy and became an MAHA referee in 1954. 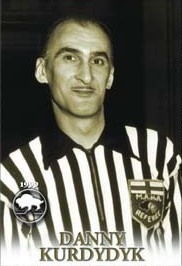 Danny Kurdydyk officiated in Allan and Memorial Cup playoffs and finals in the 1950's and 1960's. He was also involved with international hockey and officiated at world hockey tournaments from 1966-1969. He refereed until 1970 and then joined the MAHA Rules Committee. He was honoured for his dedicated service in 1983 by the MAHA.